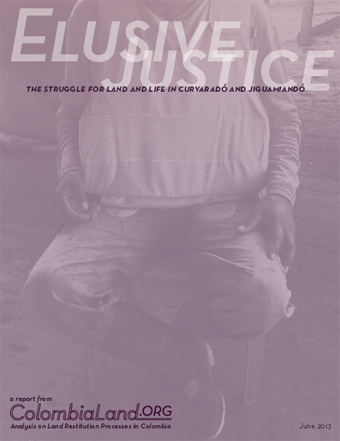 The Colombia Land Rights Monitor is pleased to announce the publication of Elusive Justice: The Struggle for Land and Life in Curvaradó and Jiguamiandó. The report includes up-to-date analysis of the armed conflict and the economic interests involved in the land grab that the Santos administration has recognized as the pilot case for land restitution in Colombia: the Afro-Colombian communities of Curvaradó and Jiguamiandó. Colombia has the largest internally displaced population in the world, and the 1997 forced displacement in Curvaradó and Jiguamiandó in northwestern Colombia is emblematic of the land grabs that have plagued the Colombian countryside for more than fifteen years. This report documents the origins of the violent displacement, in which paramilitaries and Colombian military units kicked out thousands of innocent civilians, and continues up to the present, in which multi-national corporations profit from the land grab and paramilitary groups exercise social control. Elusive Justice is based on six weeks of field research in Curvaradó and Jiguamiandó, in addition to dozens of interviews with community leaders and residents of the communities, Colombian officials, the Colombian Constitutional Court, U.S. government agencies, U.S. congressional offices, and several independent experts. The report also includes an annex with the names of over 38 bad-faith occupants in Curvaradó and Jiguamiandó that are recognized by the Colombian government as such. ← EU Instanzen werden aufgefordert, ein seriöses Monitoring der MR Verletzungen im Zusammenhang mit Bergbauaktivitäten zu gewährleisten.